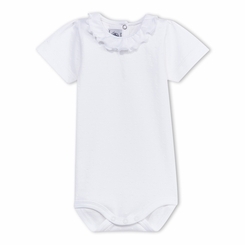 Very elegant, this baby girl's cotton bodysuit is distinguishable because of its round collar, embellished with a little ruff and small gathers, and its flocked tone-on-tone polka dots. It is made of thin cotton jersey, soft and very pleasant on bare skin. Adorable, this lovely and summery baby girl's bodysuit can be worn as an undergarment or on its own. Material: 100% cotton.